netnazgul wrote: ↑ Hello there! I guess we need a list of possible candidates, that we pass through playtesting, to determine which one would be suitable. Some of these probably still need adjustments. I've also skipped other maps, due to major flaws to my opinion. But that's my personal list, feel free to add yours. But good 6p maps are still quite rare. Currently I feel that we have 2-3 good maps + 1 official (Pie of Animosity). Maybe 6p maps should be our new focus point ? 4pl are still lacking (well, it's still hard to get a good non-repetitive map sequence for 2v2 games as I've heard, need to finally ping corrode on that), but less so than 6pl maps. That massive CRLF map needs more play. Can't remember it's name but it was quite fun, which is what team maps need to aim for a bit more. Currently they're very chokey, and big maps still do promote that type of castle play the team guys seem to enjoy alot. May have to work on a team map. All the ones that have come up because of this thread have been really good. If anyone here uses a drawing software to sketch out his maps, I've added a .svg template file for Inkscape, ready to use ! With layers, grid, dimensions, values, and colors ready. 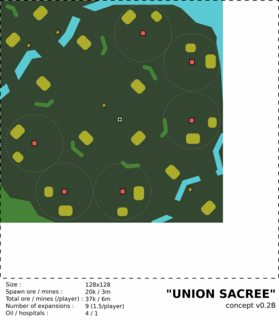 Hey guys i want to show you a map i made wich is not tested for now but i will do next week and try to improve it then. I tried to make natural looking and simultaneous as balanced as possible. I know thats really hard to do and some testings on this map are unavoidable but please dont discard it from beginning. Suggestions for changes are welcome and usually doable if reasonable. My worries about the maps you guys nominate here for the mappool are that nearly all of them are just mirrored. I know that those maps are of course well balanced but having too many of them in the official mappool would just make it look strange. I think a good mixture of different maps would be good, and some more maps with relevant water would maybe be nice? 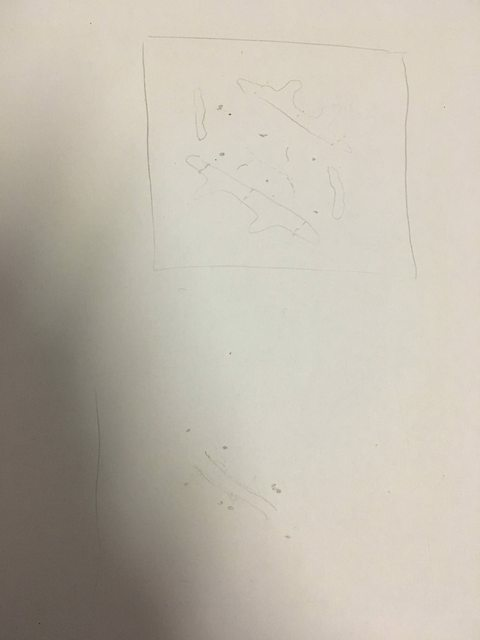 Agree with you, non-symetrical maps are also a path we have to explore. As long as it is balanced between the teams. I think your map is already good-looking and looks balanced. 80% of the resources are already in the main base. There are no areas to be contested and fought for, no expansion needed (except the center). This will probably lead to a static game. the lanes are few (if we don't count navy), and easily defendable. I'm afraid this will lead to static games. 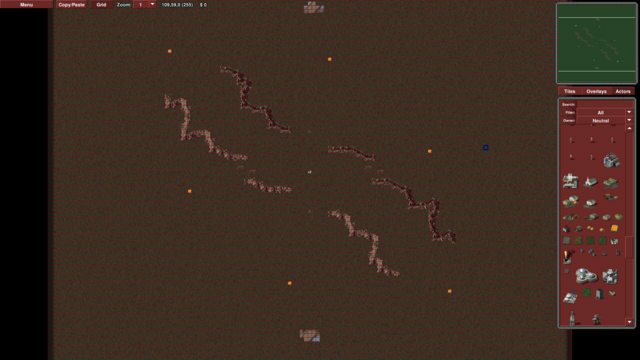 This is probably all due to the dimensions of your map (80x100), which is close to a 1v1 map (Sidestep :96c). It really looks small and crowded. I'd solve all these problems by expanding the map (go crazy : 160c ! 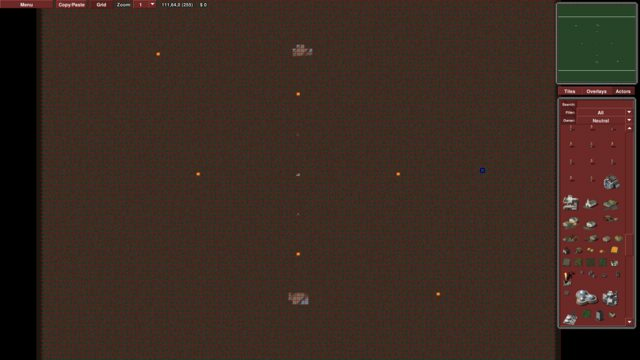 ^^), thus adding more contested areas and ground. Also, make note that you have quite a lot mines at main base (4+1gem = 6 mines, where usually there is 3). So throw some of these around the map. I'd be interested to see how this goes ! But will probably go for A (160x160), seems better. Last edited by FRenzy on Mon Nov 12, 2018 6:10 pm, edited 7 times in total. Looks great, but I would recommend going for the 128x128 version, in fact I think you can just scale down the 160x160 design without making any adjustments to the cliffs etc. I've found that once maps get above a certain size, it becomes too much in favor of Allies. Their GPS, faster ground units and Chronosphere gives them a significant advantage over Soviets when it comes to long range scouting and map control, and they have more mobile AA in the form of Longbows to deny Soviets their vision. Or of course since it's a team map you could just make sure to always have an Allied player on your team. Prefer B ore layout, but prefer the size of A. Some of those 3vs3 small maps are just watered down experiences i find. Never any sly army movement can happen. @eskimo, why do you prefer B layout ? When it comes to team maps i absolutely despise any centre ore patches that are singular. It always ends up with one team taking it and it becomes impossible to get back that ground. I think defending is significantly easier in team games than attacking as you need less team coordination, arties/v2 on auto fire, rifles don't move,pillbox tanya, gap gen, etc. Then the attacker needs to micro everything, but micro whilst a team which never happens. So given this i prefer B. It feels to have a more contestable centre area. But i would rather see that layout bigger. Wandering arties get punished, as does anything else. 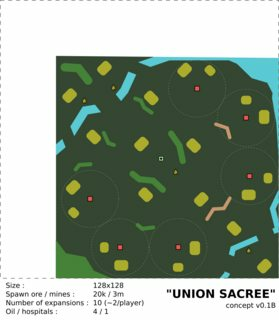 First version of "Union sacrÃ©e" is out ! 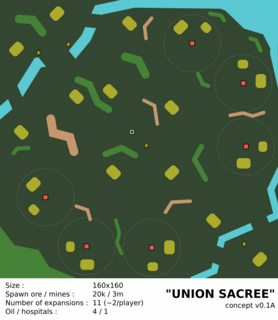 I always like to give some path for the furthest spawns to get to each other without intefering so much with other players. This allows for surprise attacks. Spawn B to D will include mines in their respective entrances to stop overcrowding to the centre early on in the game.